OF THE EIGHTH HOUSE, AND ITS QUESTIONS: THESE ARE DEATH, DOWRY, THE WIFE'S SUBSTANCE, &c. QUERY.--Whether an absent Person be dead or alive? [paragraph continues] 12th, or his own 12th in ☐ or ☍ to a malefic, or if ☽ or ☉ be unfortunate in like way, you have strong testimony that he is deceased. If the significator of the absent be strong, and in a good house, and separated from a fortune, he is not dead. If he be afflicted, and was lately in ☍ or ☐ of an evil planet, I judge that he has been in trouble or misfortune, according to the nature of the house from whence afflicted; but not dead, unless the lord of the 8th afflict him also, and the lights be afflicted. Of the Death of the Querent? If any one ask concerning the probable length of his life, or when he may probably die, observe the ascendant, its lord, and ☽; also, the lord of the 8th, an unfortunate planet in the 8th, and that planet to whom the lord of the 1st or ☽ be joined by ☌, ☐, or ☍; and you may determine the death of the querent, according to the number of degrees between the significator and the aspect of the afflicting planet. If the lord of the ascendant be in ☌ with the lord of the 8th in an angle, it notes so many years; for in this question angles do not accelerate death, but show that life and nature are strong. If in a succeedent house, months; though if the sign be fixed, it gives half years, half months. In a cadent house, weeks. But you must always consider whether the significators are extremely afflicted; if not, the querent may live longer, and only be near death at the time threatened. The lord of the ascendant is more to be considered in this case than the ☽; and, therefore, his ☌ with the lord of the 8th or ☉ is to be most feared. What manner of Death the Querent shall die? This judgment is chiefly shewn by the lord of the 8th, if in the 8th, or any planet therein or nearest to its cusp, and having dignities in the 8th house; or from the planet which afflicts the lord of the ascendant, and has dignities in the 8th. If it be either ♃ or ♀, or that they be in the 8th house, or aspect its cusp by ✶ or △, they shew a natural death by such diseases as they shew in the sign they are in, and the part of man's body it governs. If evil planets be there, they shew violent deaths, or fevers, and long and painful illnesses; and if the figure be violent, it may be by accidents, &c. The ☋ with the significator of death is very evil; and if it be ♄, (and ♀ assist by her ☐, &c.), it shews fear of poison. The lord of the 1st and 8th being the same planet, shews that the querent brings on his own death by imprudence, &c.
Whether the Wife's Fortune will be great, or easily obtained, or whether the Person inquired of be rich or not? the 4th or 10th be in good aspect with the lord of the 8th from angles. If ⊕ be in the 8th, and in ♌, or ♒, or any of the houses of ♃ or ♀, or they in good aspect to ⊕, the quesited's fortune is good. The dispositor of ⊕ in good aspect to it, or ♃ and ♀, shew the same thing. If all these happen, the quesited is very rich. If ♄ or ♀ be in the 8th and peregrine, the party is poor, or there will be contention about the property. The lord of the 8th combust, shews slow performance, and little ability of what is promised; and if ☋ be in the 8th, and no planet there, fraud is intended, or more will be promised than can be performed. The lord of the 8th in the 2d, or in ✶ or △ to its lord, the querent shall have what is promised; in ☐, with difficulty; in ☍ with much wrangling; if without reception, never. But weigh well what the particular figure promises besides these general rules. Whether the Querent shall suffer by a particular Thing of which he is in fear? If you find the ☽ afflicted, or the lord of the ascendant unfortunate and falling from an angle, or especially if he be in the 12th, and the ☽ with him, there is ground for his fear; and he may expect to be accused, &c. of much of which he is not guilty. If the lord of the 1st ascends into the 11th or 10th, or be joined to a fortune, he shall not be injured. If he apply to infortunes, the thing threatened is true; but if to a fortune, and not at the same time to an infortune, it is false or ungrounded. The ☽ in △ to ☉ discovers all suddenly. The ☽ cadent, and applying to a cadent planet, the supposed danger will be nothing, or come to nothing in the end. QUESTION.--SHALL THE QUERENT RECEIVE THE PORTION PROMISED? Judgment.--The querent's significator retrograde in the 12th, shewed he had been in despair of it, which he confessed. The female is signified by ♃ and ♀; ♃ in his exaltation, and ☽ in ♌, a fixed sign, argue that she thinks well of herself, is confident, &c., yet modest and virtuous. The ☽ being near ☉, she had a scar near her right eye. [paragraph continues] ♀ in her 2d, and also that ☽ separated from ☉, and transferring his light to ♄, lord of the ascendant and 2d and ⊕, I assured the querent that he had no cause to fear the nonpayment of his wife's portion; that all promised would be paid; and that, to his farther comfort, she would prove a chaste and virtuous woman, but somewhat proud. I have since heard, from his own mouth, that this judgment proved exactly true. 251:1 If the fatal ☌ or aspect fall in the term of ♃ or ♀, or exactly in their ✶ or △, there is much 'less fear of death. OF THE NINTH HOUSE AND ITS QUESTIONS. LONG JOURNEYS, VOYAGES, ARTS, SCIENCE, CHURCH PREFERMENT, LAW, &c.
Of a Voyage, and its Issue. If there be good planets in the 9th, or its cusp be well aspected, or the lord of the ascendant or 10th be there, and well affected, it is good. But if ♅, ♄, ♂, or ☋ be there, It is always evil. If the lord of the 9th be with an evil planet, he shall not speed well. ♄ shews losses and sickness; ♂ shews danger by thieves or pirates: and ☋ much the same as ♂, but more of cozening and cheating. The house of substance from the 9th is the 10th. Fortunes there shew wealth; infortunes loss. If benefits be in the 9th, a good voyage; if malefics, many hardships, &c.
What Wind and Weather the Querent will experience. detention by foul winds; and if near violent fixed stars; storms and contrary winds will drive him back. Of a long Journey, and its Issue. If a fortune be in the ascendant, say he will have good success before he sets out, or in the commencement of his journey; if it be in the 10th, then he will have success on the journey; if in the 7th, at the place to which he goes; and if in the 4th, it will be on his return, and when he is come home. 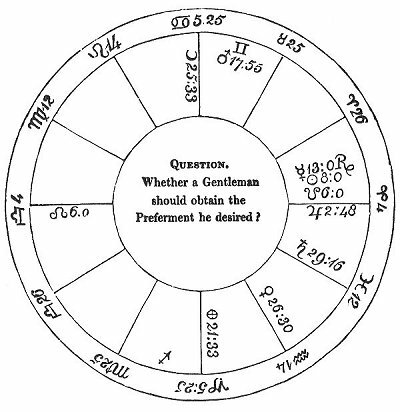 In this case ♃ gives benefits by clerical persons, judges, magistrates, or gentlemen, according to the querent's situation in life and the house ♃ rules, and the nature of the ruler of ♃. As if it be ☉, by a king, or nobleman, or person in power; if ♄, it will be by old people, or ancient matters, or farmers. &c. Let him apply to such a person in his affairs as ♄ describes, according to the sign he is in and the aspects he receives. If it be ♀, it will be by women, pleasure, sport, &c.; or by dealing in linen, silks, jewels, spices, &c. If ☿, by writing or merchandize, letters of introduction, &c. If ☽, by some female, probably a widow, or by a sailor, or by carrying news, &c., or by play. Of the Length of the Journey, &c.
The lord of the 9th, or planet therein, or ☽ in moveable signs, swift and oriental, shew a short time absent. If they be in fixed signs, slow and occidental, it shews a long and tedious journey and absence. If they be in common signs, they shew change of mind, and a varying of his journey, going to other places, &c. According as the ☽ is assisted or afflicted, judge results to happen. As, for example, if ☽ be in the 6th, or in ☍ to its lord, it shews sickness or impediments from servants. The lord of the 4th, and the 4th house, denote the final issue. The lord of the ascendant in the ascendant or midheaven, or aspected by planets therein, shows that he is thinking of returning. But if he be in the 7th or 4th, his return is prolonged; and he is not thinking of leaving the place he went to. The lord of the ascendant in the 3d or 9th, applying to a planet in the ascendant, he is on his journey homeward. The same may be judged if he be in the 8th or 2d, and apply to a planet in the 10th; but in this case observe also the ☽, and whether she aspect the ascendant, or a planet therein. If the lord of the ascendant or ☽ apply to a retrograde planet, or the lord of the ascendant be himself a retrograde, and behold the ascendant, he is coming; but if his significator be afflicted, it shews some hinderance which makes him tarry. The dispositor of the ☽ afflicted, shews hinderance also. If you find ☿ or the ☽ in the ascendant or midheaven, judge that letters or some news shall come shortly from the party; for ☿ is the significator of letters, and the ☽ of news. If they separate from a fortune, it denotes good news; and if from an infortune, the contrary. The planet from whom the lord of the ascendant of the quesited is separated, is the significator of the state and condition in which he lately was; the planet to whom he applies, of the state in which he now is; and the planet to whom he afterwards applies is the significator of him to whom he in tends to come. If the quesited's significator be going out of one sign into another, judge that he went out of the place he was in, and entered another, or that he has undertaken another journey. Observe in which of those signs he was stronger, better aspected and received, &c.; and so judge of his corresponding condition. shews some great evil; such as imprisonment, &c.; and if it be in the house of death, or ☉ be lord of the house of death, it generally denotes death. Ever consider for whom the question is asked, and take his proper significator. The lord of the 7th for a husband (or for any one who is no relation), the lord of the 3d a brother, 5th a son, &c.; and note how the fortunes are placed; if strong in the figure, well aspecting the significator of the quesited, or in his house, judge health and prosperity; and the reverse by infortunes. OF PROFIT BY, OR PROFICIENCY IN, ANY SCIENCE, &c.
The ascendant, its lord, and the ☽, are for the querent; and the 9th, its lord, or planet therein (if more than one, the nearest to the cusp), for the science. See whether the lord of the 9th be fortunate or not, oriental, angular, &c.; and whether he behold the lord of the ascendant with ✶ or △. If he be a fortune, and aspect the lord of the ascendant, the man has scientific knowledge, and will gain thereby; the more so if there be reception. If the aspect be ☐ or ☍, the man has talent, but shall do no good by it. If an infortune aspect either the lord of the ascendant or 9th, the man has wearied himself, but to no purpose, for he will never attain the knowledge he desires. If infortunes be in the 9th, or its lord afflicted, the party has but little scientific knowledge. The ☽ must also be observed with the lord of the 9th; for if they both apply to fortunes, the man is scientific; if to infortunes, the contrary. The author having given no good example regarding this question, the reader is here presented with a figure, which will no doubt prove interesting. 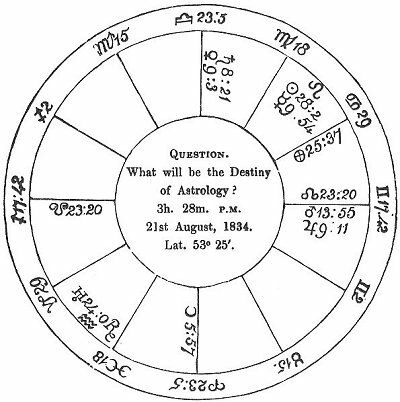 The editor being in company with two other artists, a general desire was expressed to know the future destiny of astrology, and the following figure was erected. JUDGMENT ON THE ABOVE FIGURE. the significator of the science of astrology. He is found cadent, and almost peregrine, having no essential dignity but his term, by which may be seen the present enfeebled state of the science; but as ☿ has passed through four degrees of his term in a fixed sign, this points out, that for four years it has been in some measure more in credit than previously. And this is the case, as it is about four years since the Editor's publications began to call attention to the science. 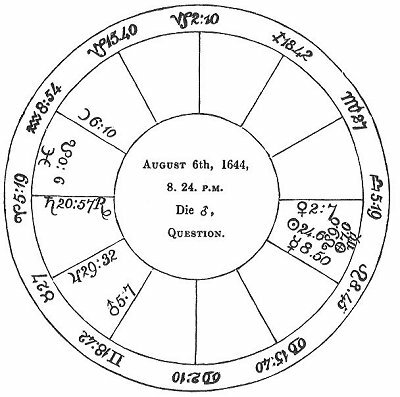 And as ☿ has just passed a ✶ of ♃, who describes the person asking the question, it is shewn that the science has been much benefited by such a person, about nine months before, because ☿ is past the ✶ of ♃ by 43', which shews about nine months, taking a degree for a year. And the fact is, that the Grammar of Astrology was published about nine months before the time of the question. The ☋ in the ascendant shews the difficulties the Editor has had to encounter, and the contumely he has had to meet in bringing the science forward again. The presence of ♃ in the 9th, denotes the discredit in which the science is generally held; and being in ☌ with ♀, it shews that injury has been done to it by elderly females, who pretend to practise divining, &c., but who are held in great contempt by the public, as may be seen by the ☽ (the general significator of the public) being in ☍ to both ♀ and ♄, from the house of enemies to the science. formed by ☿, is the ☍ of ♅, from which he is distant 14°; this may shew that some sudden mischief may be done to the interests of the science by means of female agents, as ♀ is in exact sesquiquadrate aspect to ♅. But as ♅ is retrograde, and not angular, this will not be very important. The ☉ is in the 12th from the 9th, and denotes secret enmity to the science by men in power, the ☉ being in ♌; and as he disposes of ☿, it shews that the hand of power at present keeps it down. As ☿ is 18° from ☉, 1 judge that, about the year 1852, some important honour will be done to the science; probably by the present penal laws being repealed, which forbid the acceptance of any remuneration for practising it. As ☿ has 20° to pass before he reaches his own dignities, and as ♄ will then have entered ♊, and be disposed of by ☿, I judge that about 20 years hence the science will be publicly honoured; and as has afterwards 18° to pass in a common sign (signifying months), I conceive that about 18 months after that, when ☿ crosses the cusp of the 9th house in this figure (about the year 1856), the science will rapidly rise in public estimation, and be publicly studied in colleges, &c.
The ☉ enters ♍ after two years, as he is two degrees off, which will cause the ruling powers to relax something of their severity against the science; and as he then has 18°, (equal to 18 months, being in a common sign,) to go before he passes the cusp, there will be some person of rank who will assist the science at that time; viz. three years and a half from the time of the question, or the year 1838.
and ♀ is passed away, the ☽ meets nothing out favourable aspects. It is very remarkable that the ☽ is aspected by every one of the planets before she passes through ♈. The first aspect she forms after ☍ of ♄ and ♀ is ✶ of ♃, which denotes popularity for the works of the Editor, connected with the science. The next is △ of ☿, which shews an increase of students, and public discussion. The next is ✶ of ♂, denoting increase of powerful friends, who will boldly advocate the cause of the science. The ✶ of ♅ is of little import; but the △ of ☉ being the last aspect she forms before leaving the sign, decidedly shews that at last the science will receive the highest patronage, and be publicly honoured; and as ☉ is in ♌, a fixed sign, this will be permanent. Finally, the cusp of the 4th is in the term as well as house of ♂, and is ruled by ☉, by triplicity, and face; and ☉ casts a △ thereto; ♂, lord of the 4th, is in ☌ with ♃, in ✶ to ☿ and ☽, and △ to ♄ and ♀; and he rules the ☽ by house and face, and the ☉ by face. All these are decided testimonies, that in the end the cause of truth shall triumph, and the reality and utility of the science be permanently established. ☿ in a fixed sign, and so powerfully aspected by ♄, ♃, ♂, (lord of the 4th, the house denoting the end of the matter) ♀ and ☽, is another strong evidence that ASTROLOGY IS DESTINED TO FLOURISH WHILE THE WORLD ENDURES! 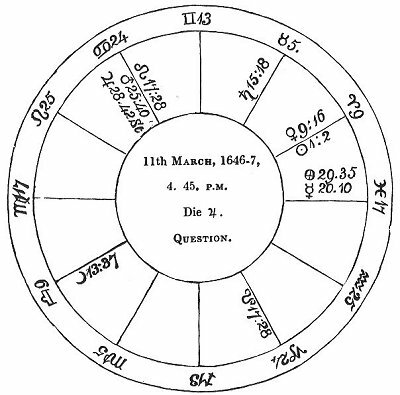 [paragraph continues] February, 1835, when the last sheet of the former edition of this work went through the press; and at the same time ♄ was in ♎ 23° 6', having just quitted the 9th house, where he had injured the interests of the science. A WOMAN ASKS OF HER HUSBAND, WHO IS AT SEA; IF ALIVE? WHEN RETURN? had weak eyes, &c., and was full of grief and sorrow for her husband, occasioned by ♄ afflicting ☿. She had also a lisp, and spoke ill; for ♄ in a bestial sign afflicting ☿, causes impediments in speech, especially if also ☽ be afflicted. ♃ signified the quesited, who being in the 10th, and lately separated from ✶ of ♀, now in the 9th, and lady of the 3d, it shewed that he had been lately some voyage south-east. And as ♃ was no way afflicted and swift in motion, as well as angular, I judged the man was alive and in health. But as ☿ who disposes of ♃, is lord of his 8th (viz. the 2d house), and as ☽ is so exceedingly afflicted by ☿ and ♄, I said he had been in much danger and peril of his life by treachery and plots of his adversaries; for ☿ is lord of the 7th from his ascendant, and ♄ of his 12th. Moreover, ♃ is accidentally but not essentially fortified, and is in his detriment, and near Oculus ♉, a violent fixed star; intimating that the man had endured many sudden and violent chances. Finding ♃ more fortified than ☽, she almost entering ♉, a southern sign, and ♃ in ♊, a western sign, and south quarter, I judged that the quesited was in the south-west or England, in some harbour, as ♃ was angular. When She should hear of Him, or see Him? have certain news of her husband, if he did not then come home. The second week in May she did hear from him, but he did not come home till July. He had been several voyages in the west, was taken prisoner by the king's forces, and, at the time of the question, was in Barnstaple. QUESTION: WHETHER PRESBYTERY SHALL STAND? [paragraph continues] ♄ therein in the terms of ♃, who is the general significator of religious matters. ♃ is now stationary, and is leaving his exaltation, and is impedited by ♂; after leaving ♋, he enters the fixed sign ♌, and is in the terms of ♄. We find ♀, who rules the 9th, in her detriment, and in the 12th house from her own, the 9th. She has twenty-one degrees to pass through in the 8th house before she get into her own sign ♉, and where she would be fixed. 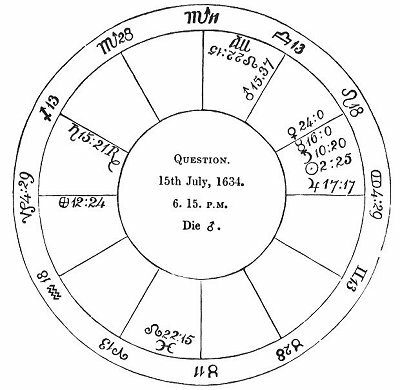 But before she reaches ♉, she meets the ☐ of ♃, (shewing that the gentry of England will oppose it), and then of ♂, (lord of the ascendant of England, ♈), hence the whole commonalty of the kingdom will disapprove of it), and all three planets at the time of the aspect in the term of ♄. There is not a single planet fixed, except ♄, nor essentially dignified, except ♃; the ☽ entering via combusta, ♂ and ☿ in their fall, ♀ in her detriment, and ♃ impedited by ♂. The ☽ separates from ♀ in the 8th, and then goes to ☐ of ♂ and ♃. From these configurations we shall form our judgment, THAT POSTERITY MAY SEE THAT THERE IS SOME VERITY IN ASTROLOGY. judgment, wavering, and decline the strictness of their discipline; and that the elders, represented by ♄, shall not be respected on account of their excessive rigidness, nor shall their orthodox opinions be consented to. Observe, that ♄ is peregrine, and supported by no favourable aspect of either fortune; there is reception between ☽ and him, but no aspect: ☿, lord of the 10th, signifying authority, is fast separating from ♄, as if the gentry or supreme of the kingdom do already decline from the severity of the austere Presbyterian clergy, fearing thraldom rather than freedom to ensue from their power. Three whole years from hence shall not pass, ere authority itself, or some Divine Providence, will inform our judgment with a way in discipline or government either nearer to the former purity of the primitive times, or better beloved of the whole kingdom of England; or authority shall in this space of time moderate many things now strongly desired. For some time we shall not discover what shall be established, out all shall be even as when there was no king in Israel; a confusion among us shall yet awhile remain. The soldiery then, or some men of fiery spirits, will arise, and keep back their contribution from the clergy, and will deny obedience or submission to this thing called Presbytery. It will then come to be handled by the magistracy, and the grand authority of the kingdom. Also, by the plurality of the clergy, or men of sound judgment, it will be contradicted, disputed against, disapproved; and these shall make it manifest that this very Presbytery, now maintained, is not the same that the commonwealth of England will entertain as a standing rule to live under. QUESTION: WHETHER, THE QUERENT SHOULD OBTAIN THE PARSONAGE DESIRED? Judgment.--In the first place, I find ☌ between ♃, lord of the 9th, and ♂, lord of the ascendant, but separating. [paragraph continues] 2dly. Neither the ☽, nor lord of the ascendant, in the 9th. 3dly. There is no planet translating the light of ♃ to ♂. 4thly. There is no reception between ♃ and ♂. 5thly. ♄ is impedited in the ascendant, and by his presence afflicts the querent, and causes him to despair of success. 6thly, The ☽ separates from a △ of ♂, and applies to ☍ of ☿, lord of the 3d; which intimated that some neighbour of the querent, either with a letter, words, or cross information, would wholly destroy the querent's hopes; and that mercurial men, viz. scholars or divines, would be his enemies: and as I found ♀ in ♎, opposing the ascendant, I judged that some female would inform against him, or prejudice him in his suit. From all this I persuaded him against proceeding any further in the matter; but the parson being covetous, would proceed, and did: and when he thought to have success, behold a scurvy letter, revealing some unpleasant truths concerning a female, dashed the good man's hopes, et exit. The querent was ♄ and ♂ exactly, had wit and volubility of tongue; and as ☿ and ☽ were in ☍, he under the earth, she in the 12th, he could never discover which of his neighbours it was that thus injured him; nor would he ask me. If he had, it must have been ♄, lord of the 12th, viz. some farmer or dealer in cattle, a sickly, repining character, living north-east, about fifteen furlongs, from him. 257:1 We do not agree with our author on this point; for unless the quesited has given his consent to the question, we think he should have the same significators as in any other question; the 7th, 5th. 3d, &c.
265:1 The reason of this is, that ♀ in the house of ♂ shews persons given to pleasure. 266:1 We have given this judgment at great length, as its complete fulfillment, p. 267 by the re-establishment of the Episcopal church, being a matter of history, is a decisive proof of the truth of the science, and of its ability to decide the most important questions both public and private The student will readily perceive that the prediction of the downfall of the Presbyterian church, as far as regards England, is made according to the strictest rules of the doctrines laid down by our author. THE TENTH HOUSE AND ITS QUESTIONS.--VIZ. OFFICE, DIGNITY, PREFERMENT, GOVERNMENT, TRADE, OR PROFESSION, &c.
THE usual significators are for the querent; and the 10th house, its lord, and the ☉, for the place, preferment, &c., inquired after. If the lord of the ascendant or ☽ be both joined by good aspect to the ☉, or by ☌ or good aspect to the lord of the 10th, and this planet behold the 10th, or be therein, the querent shall gain the thing sought for, if he use proper endeavours. Or if none of the significators be joined to the lord of the 10th, yet if the lord of the ascendant or ☽ be in the 10th, unafflicted, he shall gain it; and also, if the lord of the 10th be in the ascendant; and very easily, if the two lords be going to a good aspect. The lord of the 10th joined to ♃ or ♀, and in the ascendant, he gains the office, &c., easily; if joined to ♄ or ♂, and either of them in the ascendant, but well dignified, it will be gained, but with difficulty. The lord of the 10th receiving ☽, or the lord of the 1st, denotes success. And if there be translation of light from the lord of the ascendant to the lord of the 10th, it denotes that it will be gained by means of such a person as the planet translating the light describes. If the lord of the ascendant apply to ☌ of the lord of the 10th, and there happen no previous abscission by any other planet before the ☌ be complete, the querent will gain his desire, but he must labour hard for it. [paragraph continues] ☉, let the querent make application to such persons as they describe; for they may greatly befriend the querent by means of their influence. If the promising planet in any case be in an angle, the matter will be readily completed; if in a succeedent, but slowly; and if in a cadent, the affair goes backward at times; but may, at last, be performed, if the planet be otherwise well dignified. If an evil planet behold ☽ or the ascendant by ☐ or ☍, without reception mutual, he hinders the querent by means of that person who is to solicit the cause, &c. for him. The best sign of all is, when the two lords be joined together, and the ☽ separate from the lord of the 10th, and apply to the lord of the ascendant; but it she apply to either, it is good. If the lord of the ascendant apply to good aspect of the lord of the 4th, it denotes success; but if the lord of the 4th be joined also to the lord of the 10th, the matter shall be effected, but only after much delay and vexation. Whether a Person shall remain in the Office he holds, or not? Observe whether the lords of the 1st and 10th be in ☌, or any aspect; and note whether the more ponderous planet of the two be in any angle but the 4th; if so, he shall not be removed. But if the heavy planet be in the 4th, or approaching it from the 5th, he will leave his office. Yet, if there be reception between the two lords, he shall recover it again; and if the reception be mutual, he returns speedily, and with more honour than before. after separation be joined to a planet in any angle, except the 4th. But if the two lords (of the 1st and 10th) separate from each other, then he returns no more to his office, but loses it entirely. If the lord of the ascendant, or 10th, or the ☽, are disposed of by any planet in an angle, (except the 4th), and that planet be slow in motion, he shall not be removed until that planet. be combust or retrograde, or leave the sign he is in; but much about that time he will be removed, unless some powerful aspects intervene. If the ☽ be joined to the lord of the 10th, and he in the 10th, the officer or governor, &c., shall not be removed. If the lord of the ascendant, or ☽, be joined to the lord of the 10th, and he more weighty than either of them, and in the 10th, 11th, or 5th houses, free from impediment, though he behold not the 10th, the officer shall be transferred to some other place or office; but if he behold the 10th, he shall remain where he is. If the ☽ be joined to any planet not in his essential dignities, though with reception, (unless it be ♃ or ♀ by ✶ or △), the querent shall leave his employment, office, &c. If either the lord of the 4th, or ☽, be in the 4th, and ♈, ♋, ♎ or ♑, be on its cusp, he will leave it; and this is more certain if ☽ be then joined to the lord of the 4th, and he peregrine. The same may be feared if ☽ be in ♑, and afflicted, or if she be void of course, and the lord of the ascendant be afflicted. Whether a King expelled his Kingdom, or an Officer having lost his Place, shall be restored? be in ☌ with the lord of the 10th, and the more ponderous planet behold the 10th house, then the king or ruler, &c. shall be restored. If the planet do not behold the 10th house, observe whether ☽ be joined to any planet in the ascendant, or 10th, which also will denote his restoration. If ☽ be in ♈, ♋, ♎, or ♑, he returns the sooner. If the lord of the 10th be joined to a planet in the 10th, or the ☉, (but not by ☌ to ☉), it denotes the same. The lord of the 10th a lighter planet than the lord of the 4th, and separated from him, argues the same. If the lord of the 10th be lighter than the lord of the ascendant, and be joined to him, he shall return to his office, &c. So also, if ☽ be joined to the lord of the 10th, and behold the 10th house, unless disposed of by a peregrine planet under the earth. The lord of the 1st aspected and received by a planet not afflicted, he returns; if not received, he will not. The ☽ joined to a planet in the 9th, (it not being a fortune), shews that the king, &c. recedes from his kingdom, &c. If it be a fortune, and in ♈, ♉, ♋, ♌, ♎, cp, aq, he will return; and if it be in ♊, ♍, ♐, or pi, he obtains office, power, &c. in another place. Of the Profession, Trade, or Employment of which any one is capable. cusps of those houses, the, and ☽, also the places of ♂ and ♀; for these two planets are the significators of trade or employment. Observe which of the two (♂ or ♀) is the most powerful, and note the sign he may be in; also consider the four angles, and any planet in them. If they be in fiery signs, or the majority of them, (viz. ♂, ♀, the planet in an angle, and the cusps of angles, especially the 10th), and ♂ have any dignity in the place of the lord of the 10th, or the ☉, say the querent will make a good tradesman, &c. in any business where fire is used, or of its nature; and if the lord of the 10th be in his exaltation, he will do well in serving the king, or any high nobleman, &c.
If the significator of the employment, (usually the lord of the 10th, or a planet, especially ♂ or ♀, in the 10th, near the cusp), be in ♈, weak, he will make a good cattle-dealer, groom, farrier, grazier, &c.; if strong, a coachmaker, veterinary surgeon, &c., where he has to do with horses or great cattle, in a respectable way. If the significator be in ♉, then husbandry will best suit him; or gardening, corn-dealing, grazing, &c.; or if ♀ be the significator, such things as appertain to women's affairs, a soap-boiler, fuller of cloth, scourer, &c.
If the significator be in ♊, he will make a writer, clerk, bailiff, &c., or a surveyor, painter, astronomer, astrologer, geometer, schoolmaster, &c.
If he be in ♋, he will be fitted for a variety of occupations; but he will be likely to go to sea, or to deal in liquids, such as wines, beer, &c.; and he will be fond of political distinction. If he be in ♌, he will make a good horse-jockey or coach-man; a smith, watchmaker, glassblower, huntsman, or cow-doctor; or to do with any trade which uses fire. power, a schoolmaster, accountant, stationer, printer; he will be an excellent politician, or be a good astrologer, &c.
If in ♎, he will be a good poet or orator; singer, or musician; silkman, or linendraper, &c.
If in ♏, he may prove a good surgeon, apothecary, or physician; or a brazier, founder, brewer, vintner, waterman, of master. If in ♐, he will do very well to make a clergyman, to study chemistry, to buy and sell cattle, or to be a cook or butcher. If he be in ♑, he will prove a good chandler, victualler, farrier, farmer, dealer in wool, lead, or farming commodities. If he be in ♒, he will make an excellent ship-carpenter; and if any planet aspect him out of a watery sign, he may prove a good sailor or ship-master, or a painter and ornamenter of ships, or a merchant. If he be in ♓, he makes a good jester, singer, player, &c., or brewer, or fishmonger; but generally the genius is dull, and the party given to sottishness. As fiery signs shew workers at the fire, whether gold-smiths, &c., or bakers, &c., so earthy signs shew occupations connected with the earth, as potters, ditchers, brick-makers, gardeners, &c.; airy signs import singers, game-keepers, actors, &c.; and watery, sailors, fishermen, water-men, laundresses waiters in taverns, &c.
The ascendant and ♀ are for the querent, the 10th house for the office or preferment he expected. in ☍ to the ascendant, with ☋, and was lord of the 11th, I judged that he employed as a friend a solar man, who was false, and did rather envy than feel friendly to him. I concluded, that with some difficulty he would obtain the office, notwithstanding the opposition a pretended friend offered; and so it came to pass within three weeks, and he then discovered that his friend was false; who had a great scar in his face, his hair of a blackish colour, shewn by ☉ being so near ☋. The separation of ☽ from ☐ of ☿, argued that he had delivered many petitions about it, hitherto without any success. 272:1 This rule will answer the question of the re-election of any Member of Parliament for any place he has formerly represented; as well as the restoration of any minister, &c. to power, or the return of any individual to any office or employment. OF THE ELEVENTH HOUSE, AND ITS QUESTIONS, VIZ. OF FRIENDS, HOPES, PROPERTY OF THE KING, &c.
IF the lord of this house be strong, fortunate, and well aspected, it foreshews the obtaining the thing hoped for; also the love and concord of friends, &c., if that be the question. Observe whether there be any good aspect or reception between the lord of the ascendant and 11th, or translation of light, or that the lord of the ascendant be in the 11th, or the lord of the 11th in the ascendant. All or any of these give reason to expect it. But if there be none of these, note the ☽, and if she be not well qualified with the lord of the 11th, nor any benefit, or ☊ in the 11th, judge the contrary. The lord of the 11th in an angle, received by the lord of the ascendant, you may judge in the affirmative. sign, he shall have but a little, a mere sign of the thing; but if the receiver be in a fixed sign, he shall have the whole or complete thing. Yet, if the receiver of ☽ be unfortunate, the matter shall get some injury or hurt, &c. after he is in possession of it. If there be mutual reception between the receiver of the ☽ and the ☽, he shall obtain the thing, and more than he looked for. And if the lord of the ascendant be also received, he shall obtain whatsoever he hoped for, that is feasible or possible. If the querent's significator or ☽ apply to a fortune, not cadent, he may expect the thing desired. N.B. if the querent name the thing hoped for, then judge of it by its own proper house, &c.; as, if it be money the 2d, if it be children the 5th, &c.
Good planets in the 11th, or ☊ there, or good aspects between the lords of the 11th and ascendant, denote the friends of the querent to be sincere; and if they throw good aspects to the cusp of the 2d house, its lord, or ⊕, it denotes gain thereby. Evil planets, and evil aspects in like manner, denote false friends and losses. The lord of the 12th in the 11th, denotes a secret enemy under the guise of friendship. ☿ in the 11th, shews wavering, unsteady friends, unless he be in a fixed sign. 277:1 These rules are not found in our author. OF THE TWELFTH HOUSE, AND ITS QUESTIONS, VIZ. OF IMPRISONMENT, GREAT CATTLE, PRIVATE ENEMIES, BANISHED MEN, &c.
IF a question be asked regarding secret enemies, who are not named, observe the lord of the 12th, and planets therein, how they aspect the lord of the ascendant, and from what houses, &c. If the lord of the 12th behold the lord of the ascendant from the 6th, 8th, or 12th, or from the 4th, 7th, or 10th, then there are some who privately wish ill to the querent. To know who a private Enemy is. Observe how the lord of the 12th is affected, and whether he be with good or evil planets, and how he behold the lord of the ascendant. If he be in the 6th, or joined to its lord, it spews the secret enemy is afflicted with some secret disease or malady; if the lord of the 6th be in the 12th, he is also sickly. If the lord of the 12th be in the 10th, or with its lord, he is in favour with the king or some person of rank; and if he be strong, it will not be well for the querent to meddle with him, especially if he aspect the lord of the ascendant or ☽ by ☐ or ☍. If the lord of the 12th be with the lord of the 4th or 8th, or in those houses, he is sickly or near dying, or is repining, and very miserable. Consider and judge farther, as in former cases directed. planet in the 3d or 9th by ✶ or △, or by ☐, if with reception), he shall soon leave the prison; the same, if she aspect the lord of the 3d or 9th, and be not in an angle. As you judge by ☽, judge also by the lord of the ascendant. But these aspects must be by application. The lords of the angles being in angles, is an ill testimony; and so much the worse if the lord of the ascendant be in the 4th, or if either he or the lord of the 12th dispose of each other. It is still worse if the lord of the ascendant be disposed of by a planet in an angle, especially a malefic; and worst of all if that malefic be in the 4th; and if he be the lord of the 8th, he may expect to die in prison. The ☽ disposed of by the lord of the 12th, or any malefic, is a sign of a long stay; and it is still worse, if her dispositor be in an angle, and especially in the 4th. If, however, the disposing planet be in a moveable sign, or swift in motion, it shortens the time; but a retrograde planet shews a long detention. If the lord of the ascendant, or ☽, be combust, it shews a long imprisonment. The ☽ and ☿ in moveable signs, when ☿ is lord of the ascendant, shews speedy enlargement, especially if they aspect a fortune. If ♃ ascend, or be in ☌ with ☽, or ♀ be in the ascendant in ☌ with ☽, or ☿ be in ☌ with ♃, and aspect the ☽, or ☽ apply to ♃ or ♀, he will be discharged. The dispositor of ☽ with a fortune denotes the same. Whether a Prisoner of War shall escape or be exchanged, &c.
If the lord of the ascendant separate from the lord of the 4th, and apply to a fortune; or if the lord of the ascendant be cadent, or leaving an angle, he shall escape. Also if he separate from combustion, or ☽ get from under the beams of ☉. An infortune in ♒, shews a long imprisonment. If the lord of the ascendant be in his fall or detriment, and the ☽ in ♒, the same; also the ☽, or lord of the 1st, in the 8th or 12th. If ☽ apply to a fortune, and the lord of the ascendant and the cusp of the ascendant be fortunate, it denotes liberation. Note.--♀ is better than ♃ in this question, especially if in aspect to ☿ or ☽. If ☽ be with ♄, and ♃ behold them by ☐, and ♂ by △, it denotes that, after a long confinement and suffering, he shall break prison and escape. If a felon, &c., be imprisoned when ☉ ascends or rules the ascendant, he shall escape (the ancients declare) within a month; if ♀, within 40 days; if ☿, he has long imprisonment; if ☽, his state will depend on and change according as she has applications with other planets; if ♄, he has long confinement; if ♃, short; and if ♂ he shall be ill-treated, beaten, put into irons, &c.
JUDGMENT ON THE ABOVE QUESTION. The prisoner's person is described by ♐, the cusp of the 12th, and by ♃ in ♌. 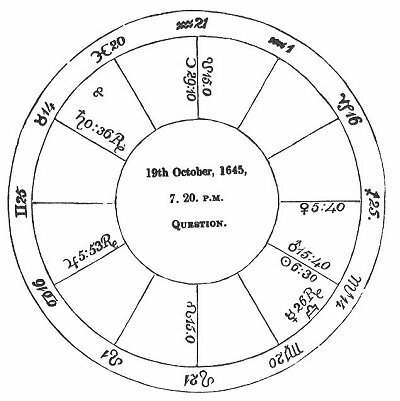 The way he went, and intended to go, is here shewn by the cusp of the 12th ♐, and by ♌, where ♃ is, and by the sign and quarter of heaven wherein we find ☽. yet out of town, or, at least, that he would not be far from town. And as ♃ was in the 8th, I judged that he lay obscure for awhile, viz. a night; but that then he would go away, (which he did). I confidently affirmed, that he should be taken again by some man of authority; for ☽ separated from △ of ♃, his significator, and applied to ☍ of ☉, both in angles. It never fails, but that if the ☽, or the significator of a fugitive, be afflicted by an unfortunate planet in the 7th house, that fugitive, or prisoner, is again taken. 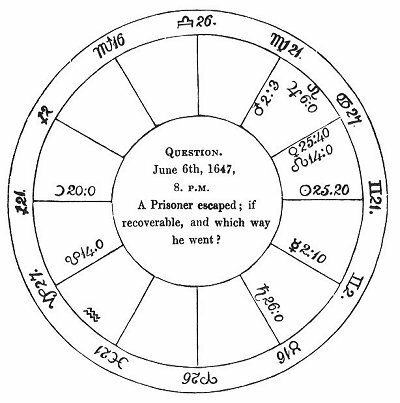 In the next place, I found ♃ and ☿ in ✶, ☿ in his own house, and applying to ♃; therefore I judged that the querent should have news of the prisoner by letter, or by some young man, within six or seven days, or when the significators came to ✶ aspect; which was six days afterwards. The truth is, that on the next Friday he had a letter to tell where he was, and on the Sunday he apprehended him by authority. QUESTION.--A LADY ASKS WHEN HER HUSBAND, WHO IS IMPRISONED, SHALL BE DELIVERED? assured that either he was, or would be, within three day; discharged from his imprisonment by means of a solar man, a commander who would release him and furnish him with what was necessary for his convenience. The truth is, he was released, and the garrison where he was prisoner taken the day before the question was asked, (when ☉ was in △ to his significator), by an honest parliamentary colonel, who plentifully relieved him with money, and all convenient necessaries. ♃ in his exaltation, retrograde, in a moveable sign, and in △ to ☉, shewed short imprisonment; the more so, as ☉ is lord of the 4th, and the △ so perfect. The Time of His Excellency ROBERT Earl of ESSEX last setting forth into the West of England. Here ♒, the ascending sign, well represents his form of body, for it was comely, &c. ♄, ☿, and ♀, his mind, they having all dignities in the ascendant. ♃ has also much to do with his qualities, being lord of ♓, an intercepted sign in the ascendant. I first considered that the ☽ separated from a △ of ♄, and applied to a ☐ of ♂, lord of his house of substance, assistants, &c., and also of the 9th, his house of journeys. This intimated he should have but slender success, and lose much by his present march. Finding ☋ in the ascendant, I judged that he would be betrayed in his councils; and seeing ♄, lord of his ascendant, peregrine, and in his fall in the 2d, the ☽ in her detriment, and ⊕ disposed of by ☿, lord of his 7th, signifying his enemies, and that ♃, the general significator of wealth, casts a ☐ to the ascending degree, I gave this judgment:--that his Excellency must expect no success from this employment; that he would have no honour by the journey; that he would be extremely crossed by men of great power here at London, who pretended great friendship to him; (♃, lord of the 10th and 11th, being in ☐ to his ascendant), that he would be betrayed wholly, and be in danger to lose all; that, in short, I was extremely sorry he had chosen so unlucky a time to set forth, &c. &c.
The issue was thus, (for I write to posterity): he prospered in the beginning, and daily men of good quality and authority jeered at me, and derided my prediction. I was quite content to be abused, provided that he might have had success. But observe, that on the 8th September following, came sad news, that on the 2d of September this worthy man had surrendered all his ammunition to his majesty, having only quarter for his soldiers; with some other articles, which were dishonourably performed, to the eternal shame of the royal party. The above remarkable era in the life of King Charles the First affords a striking illustration of the truth of the rules of the science as laid down by our author. Here we find ♄ peregrine, and retrograde in the ascendant, a decided testimony of ill success; the ☋ is also ascending, a sign of evil and treachery to the King. His second house is afflicted by ♂, who is in his detriment, and disposed of by ☿, the significator of his adversaries. The King's ⊕ is afflicted by ☌ of ♂, and by ☐ of ☿, having only the ✶ of ♃, who is retrograde, and in ☍ to ☉n, the joint significator of his foes. Then we find the ascendant in ☍ to ☿, the significator of the enemy; and also the ☽ in ☐ to the ☉, cadent and peregrine. Each one of his significators is afflicted, and ♃, the lord of the 11th, his house of hopes, and of the 10th, the house of honour, and dispositor of ☽, is afflicted by the ☍ of ☉, by being retrograde, and by being within orbs of a ☌ of ♄, lord of the 12th, the house of disgrace and misfortune. Now as regards the adversary, we find ☉ and ☿ both ruling the 7th, and placed therein in mutual reception, ☉ being in the house of ☿, and ☿ in the house of ☉. The ☊ is also in the 7th, and ♀ lady of their 2d, or house of substance and means, assistants, &c., is strong in her own house n, angular, and no way afflicted. except being retrograde; and he is in the term of ♂, and ♂ is in his term; another mutual reception. All these things were decided testimonies that his Majesty should fail in all his endeavours, and eventually be ruined. The lord of the 12th being also lord of the ascendant, shewed that he had been himself his greatest enemy, and the cause of his misfortunes. The lord of the 12th, (house of imprisonment) being in the ascendant, shewed that he should be imprisoned; the more so from his being in ♓. And history tells us how truly the "signs of heaven" spoke on this occasion; for "all the remainder of his life, after this August 22d, 1642, was a mere labyrinth of sorrow; a continued and daily misfortune." The student will perceive that his death was plainly foreshewn by the ☽ applying to ✶ of ♀, lady of the 8th, or house of death, from signs of long ascension; in which a ✶, it is said, has the same effect as a ☐ in other signs. The ☽ moreover is with Antares, a violent fixed star, (now in about 7° 30' ♐) which is said to denote a violent death; which is farther shewn by the ☐ of ☽ to ☉, the latter being in an angle. The lord of the 4th being in to the ascendant, was also a token of his death; and perhaps ♏ being in the 8th, and ♂, its ruler, approaching Caput Algol, which is said to denote beheading, might intimate that; but all such minute points must be left to posterity to decide, when the science will be better understood. in this figure. The ☽ is in the 29th degree, of ♑, a ☐ aspect to the cusp of the 8th, in this also; and ♃, part lord of the ascendant here, is in ☌ with the place of ♀, lady of the 8th. 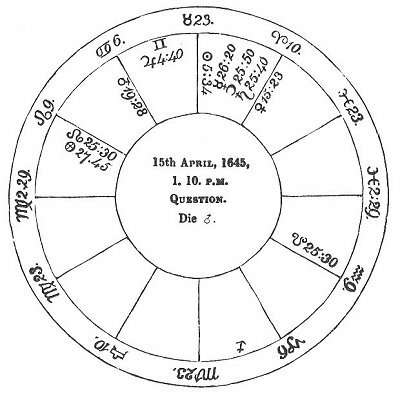 All these coincidences must be considered by the genuine searcher after truth as strong evidences of the truth of planetary influence, as evinced in horary astrology. The consequences and final result of the mad attempt of this unhappy King to make war upon the nation were here plainly depicted; and it is for the opponents of astrology to shew, that these things are merely accidental coincidence, or the fruit of chance, the deity they so fondly worship. OBSERVATIONS ON THE ABOVE FIGURE. 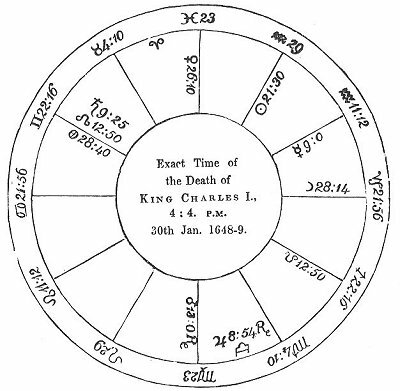 King Charles I. was born at Dumfernline, in Scotland, about fifteen miles from Edinburgh, on the 19th November, 1600; at which time ☉ was in 9° of ♐. 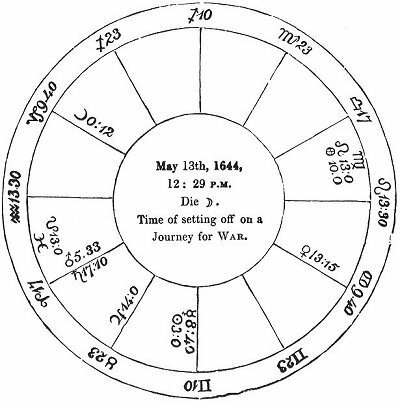 Hence, at the period of his death, ♄ was exactly in ☍ to the place of ☉ at his birth, and ♂ nearly in ☐ to that place. 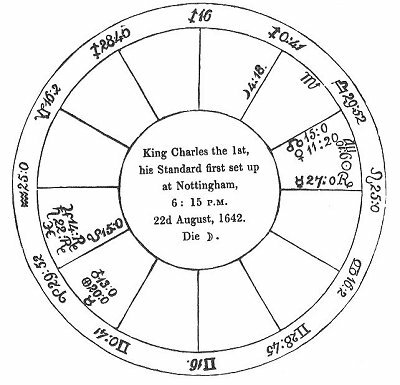 place at birth; a decided cause of failure, discredit, &c. But although we mention these circumstances, we would remind the student that such transits can have but little effect unless evil directions be operating at the time; which, there can be no doubt, was the case in the nativity of the unfortunate and ill-advised King Charles the First. If we regard this figure as that of the exact commencement of the COMMONWEALTH, we shall find that it will point out the result of that change in the government, as it would of any other thing which might then have commenced. The ☽ is lady of the ascendant, and she is in her detriment and peregrine; hence the commonwealth was not successful; her being in a moveable sign, and moveable signs on the ascendant and 7th, and such signs intercepted in the other two angles, shewed that it would not be permanent. The lord of the 4th being also lord of the 12th, shewed that it would come to an end by means of the exertions of its secret enemies; and as ♄ is also lord of the 7th, and rules the ☽, it shewed that its enemies would overthrow it at length. The end of it was clearly pointed out to be when ☽ came to ☌ of the lord of the 4th, ☿, and to the △ in signs of short ascension of the lord of the 8th, ♄, who is very powerful, as being in reception with ☿, and △ with ♃, and ruling both ☉ and ☽, and being also with ☊. If we calculate from the place of the ☽ to the △ of ♄, we shall find eleven degrees and a quarter, which would be equivalent to eleven years and a quarter; which, it is well known, was THE EXACT DURATION OF THE COMMONWEALTH. 286:1 "The King had lain most part at York, or rambled into some other counties near adjacent, until August, and done little to any purpose. p. 287 For the several counties were generally nothing inclinable to his purpose; in most whereof, and in every county he came in, he rather received petty affronts than support. Yet at last he came to Nottingham, and there set up his STANDARD, (with a full resolution for war), the 22d August, 1642, under this constellation; having some few horse with him, but in great expectation of more aid from the Welsh, &c., whom he thought most doted on monarchy." --Monarchy or no Monarchy, p. 112.